At the end of October I announced that Maria from my team and I published a Microsoft Virtual Academy on ASP.NET Core. 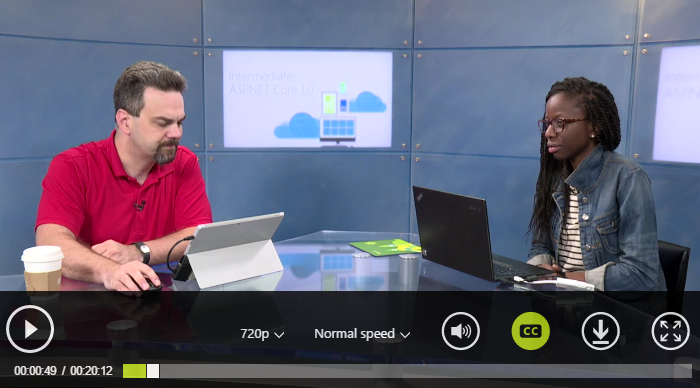 This Free ASP.NET Core 1.0 Training is up on Microsoft Virtual Academy now for you to watch and enjoy! I hope you like it, we worked very hard to bring it to you. Again, start with Introduction to ASP.NET Core 1.0, and explore this new technology even further in Intermediate ASP.NET Core 1.0. In a few weeks (maybe sooner) we'll publish Day 3 which we'll do exclusively on Macs and Linux machines. We'll talk about Cross-Platform concerns and Containers. NOTE: There's a LOT of quality free courseware for learning .NET Core and ASP.NET Core. We've put the best at http://asp.net/free-courses and I encourage you to check them out! First part was really helpful. Now will watch this intermediate part. Thank you Scott and team for putting this together. Many thanks for these tutorials, etc. on ASP.Net Core. I particularly liked the way that you and Maria constantly swapped between the teacher/student roles and asked the questions that you thought the viewers would be asking.